Our trip starts in Aspen, Colorado. This town was founded as a mining camp in the 19th century and named after the abundant aspen trees in the area. With the closing of the mines at the beginning of the 20th century, its future looked bleak, but this changed when Aspen became an international well-known ski-resort after WWII. We take the Colorado State Highway 82 and leave the town eastwards, following the Roaring Fork River upstream. The road is climbing constantly until, after about 15 miles, we reach Independence Pass (12,095 ft). The pass is located at the summit of the ridge of the Sawatch Range on the Continental Divide and is part of the White River National Forest. We are now well above the tree line and surrounded by a grassy tundra terrain. The pass is very narrow and steep with a 6.5% gradient, including tight switchbacks on each approach. The pass is always closed from the first heavy snow fall in autumn until it opens up in late May or early June. Click here to check if the pass is open. After driving over the pass, it’s a 15 mile descend to Twin Lakes. This little village is located next to two big mountain lakes (hence the name). The scenery is very beautiful, especially when you see the reflections of the high mountain peaks in the water. Just after Twin Lakes we reach the junction with State Highway 24, where we drive north, following the Arkansas River upstream to Leadville. 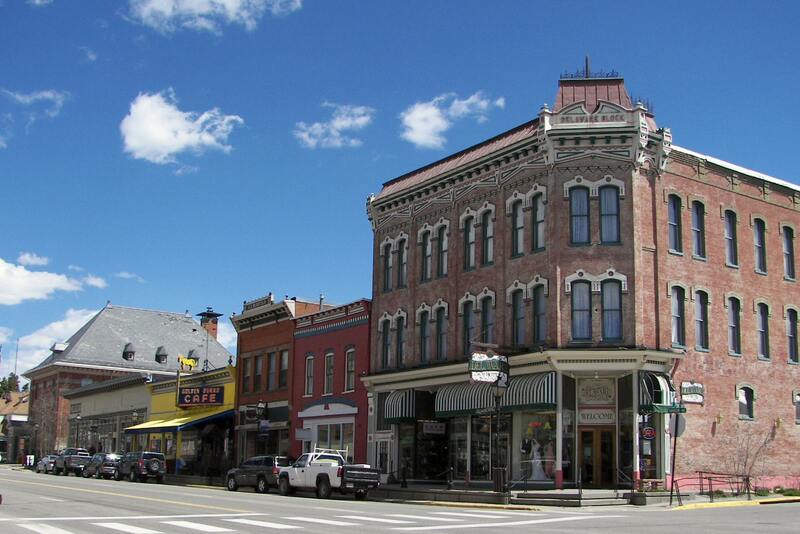 With its elevation of 10,152 feet (3094 m), Leadville is the highest incorporated city in the United States. This former silver mining lies near the headwaters of the Arkansas River and is home to the Leadville Historic District, which preserves many historic structures and sites from Leadville's dynamic mining era. It includes sixty-seven mines in the mining district east of the city up to the 12,000 foot (3658 m) level, and a defined portion of the village area. You can also visit the National Mining Museum here. The town is also home to the annual Leadville Trail 100 (also known as The Race Across The Sky). This ultra marathon is run on the trails and dirt roads through the heart of the Rocky Mountains. The course is 100 miles long, starting at 10,200 feet (3,100 m). The runners in the race climb and descend 15,600 feet (4,800 m), with elevations ranging between 9,200-12,620 feet. It is common for less than half the starters to complete the race within the 30 hour time limit. We continue north on State Highway 24 to Tennessee Pass. This high mountain pass (elevation 10,275 ft) traverses the continental divide again. The pass has a gentle approach on both sides with few steep gradients and no major hairpin curves. The road over the pass is generally open all year round and closes only during severe winter storms. Ski Cooper is located at the summit of the pass. This ski area in the San Isabel National Forest is located above the tree line, providing a panoramic view of the peaks of the Sawatch Range. The area was formerly a World War II training ground of the 10th Mountain Division from nearby Camp Hale. A memorial to troops of the division is located at the summit of the pass. The remains of Camp Hale can be found a few miles further down the road. Soldiers were trained here in mountain climbing, Alpine and Nordic skiing, and cold-weather survival. After the war, the camp was abandoned and nowadays only some ruins of the barracks remain visible. The 10th Mountain Division veterans are the people who are primarily responsible for establishing skiing as a viable winter sport in the USA and for building the very first big ski areas and resorts in America. As we keep following State Highway 24, we arrive in Red Cliff, a former mining camp. The town is concealed below the highway, which passes over the Red Cliff Bridge, and is accessible by a side road. The town consists of a cluster of older homes and converted trailers on the flanks of the canyon around the river. Back on the 24, we follow the deep and narrow Eagle River Canyon. This is an area with a few old mining roads off to the east but most of them are barricaded; which indicates that they are either very dangerous sites or the mine is still in production. The road goes into the canyon, and then comes out again right over the Gilman mine works before diving back down to Minturn. On the northwestern flank of Battle Mountain, just before we reach Minturn, there's a couple of switchbacks so the road can descend comfortably towards the river. The views north and west here are spectacular. A few miles further, the road ends at the junction with the interstate near Eagle-Vail.